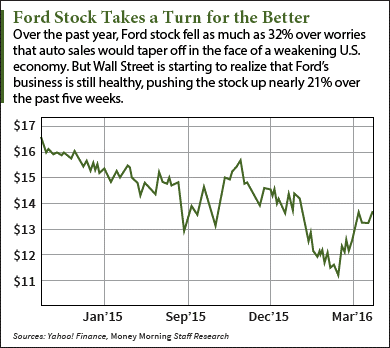 One of America's "Big Three" automakers, Ford stock hasn't fared well over the past year. At one point the Ford stock price was down 30%. But Ford Motor Co. (NYSE: F) is doing a lot of things right – things that will pay off down the road. That's why we've named Ford stock Money Morning's Pick of the Week. "Ford is turning three areas of opportunity into major points of corporate focus. And that positions this already-innovative carmaker as a front-runner among the big auto producers," said Money Morning Executive Editor William Patalon III, who calls Ford his "favorite carmaker." More than any other company, Ford shaped the U.S. automobile industry. Founded in Detroit by Henry Ford in 1903 with $28,000 of capital, Ford Motor Co. was nearly broke by the time it sold its first Model A. But within six weeks, the young company had turned a $37,000 profit. In 1908, Ford introduced the Model T, a car designed to be easy to maintain and affordable for most Americans. By the time the Model T was discontinued in 1927, 15 million had been sold. The need to build cars more quickly to meet rapidly rising demand led Ford to innovate several breakthroughs. The assembly line reduced Model T chassis production from 12.5 hours to 1.5 hours. The next year Ford doubled pay to $5 a day to reduce turnover, and cut the workday to eight hours so he could run three shifts a day. Ford acquired Lincoln Motor Company in 1922, which became a luxury brand. In 1938 it introduced the mid-priced Mercury brand, which later became its entry-level brand until it was discontinued in 2011. After World War II, Ford introduced several iconic and trend-setting vehicles, including the F-Series line of trucks (1948), the Thunderbird (1954), the Mustang (1964), and later the Taurus (1984). The tradition of innovation continued in the 21st century with the EcoBoost engine (2009), and, in recent years, a focus on incorporating the latest tech trends into its business. Ford is headquartered in Dearborn, Mich., and employs 199,000 workers. The company had revenue of $140.6 billion in 2015. Wall Street believes U.S. new car sales have peaked, therefore Ford's earnings will suffer. Investors went along, at one point chopping as much as 32% off the price within the past year. And yet 2015 was the best year ever for U.S. auto sales – the 17.5 million vehicles sold represented a 5.7% increase from 2014. But Ford reported strong Q4 earnings in January, beating estimates by $0.07 a share and reporting a 12% increase in revenue. At first Wall Street yawned, but since mid-February F stock has climbed nearly 21%. Still, investors underestimate this iconic company. Ford is capable of more earnings growth than many of the analysts realize. And it's because Ford once again is emphasizing innovation. Rather than get run over by technological disruption, Ford is embracing it. "Ford sees big futures in such nascent areas as ride-sharing, driverless autos, and the 'connected car,'" Patalon said. But instead of just paying lip service to innovation, earlier this month Ford created a subsidiary, Ford Smart Mobility LLC, to make it happen. The new subsidiary will continue the company's current efforts, which include an investment in a London car-sharing program, experiments with autonomous vehicles, and its homegrown "SmartDeviceLink" technology that links smartphones and autos. "Ford Smart Mobility is being positioned as a startup firm," Patalon said. "The plan is to have it design and build its own mobility services – while also collaborating with other tech firms." It's just the latest sign that Ford realizes the auto industry is about to be, to paraphrase Netscape founder and now venture capitalist Marc Andreessen, eaten by software. "More today than ever before, the character, the DNA of our vehicles, is being created by software. That's why it's important to recognize that we're more of a software company today than a hardware company – at least in terms of the impact to consumers," Jim Buczkowski, head of Ford's electronics research group, told Digital Trends. Ford CEO Mark Fields said the new subsidiary will target the $5.4 billion transportation services market, which will add to revenue and act as a catalyst for Ford stock. Patalon also noted something most others have missed – the person chosen to lead Ford's Smart Mobility subsidiary, Jim Hackett, is "a proven winner" who will report directly to Ford CEO Mark Fields. A former Steelcase Inc. (NYSE: SCS) CEO who has been a member of Ford's board of directors since 2013, Hackett is just the kind of multitalented manager Ford needs to make its new subsidiary a success. Ford's price/earnings ratio is 7.4 right now, below the auto industry average of 9.6, as reported by Morningstar. And Ford's five-year average P/E is 9.4. At that level, Ford stock would be worth $17.30, which is 26.4% higher than the current price of $13.69. But Ford expects its profits to rise this year, and the analysts agree. The 2016 estimate for Ford's earnings per share (EPS) is $1.97. That would boost Ford stock to $14.58 at a P/E of 7.4, and $18.52 at the historic P/E of 9.4. Looking further ahead, the EPS estimate for 2017 is $2.06. That would drive Ford stock to $15.24 at a 7.4 P/E, and $19.36 at a 9.4 P/E – a gain of more than 41%. And that doesn't count Ford's impressive 4.4% dividend yield, which pushes those gains even higher. So Ford stock delivers both growth and income. It doesn't get much better than that. Money Morning: Meet the One-Man Profit Catalyst Behind the "Car of the Future"